When I’m anxious to bead but nothing strikes my fancy, I’ll go through all my beading magazines, online patterns and books until something makes my fingers itch to create. This pattern called out to me. It was in the December 2009 Bead and Button magazine, designed by Melanie Colburn. It is intended to be a brooch but its size, 3 3/8″ , makes me want to do something else with it. For now I’ll use one of my grandmother’s old hat pins to attach it to a heavy coat this winter. I’d like to make another one with a sunny, yellow Rivoli in the center with different shades of soft yellow, pastel blue and green beaded leaves and petals. But what kind of backing should I use? Suggestions? Until an answer comes along in the form of more beading and embroidery experience, I’m on to my next project. 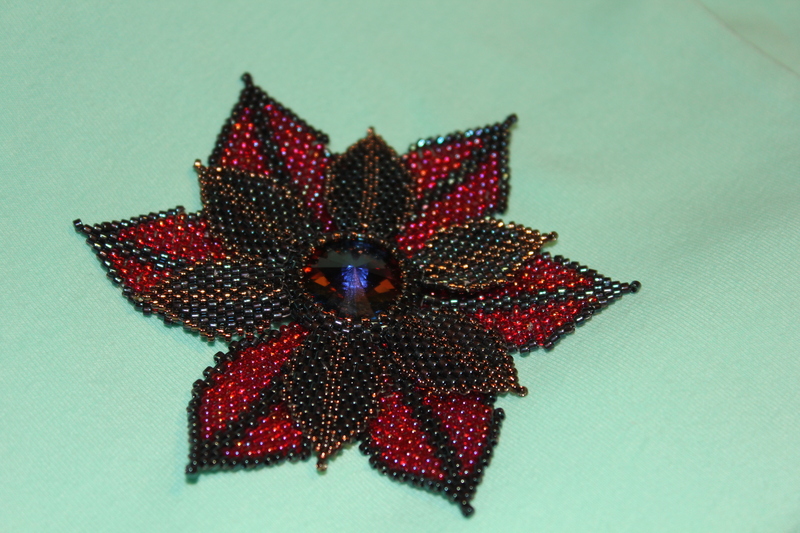 This entry was posted in Bead and Button magazine, Beading and tagged Bead and Button Magazine, Beaded Dahlia, beading. Bookmark the permalink.